All photos in this post come from Apple devices at Consumerist HQ. They’re the ones we didn’t throw out yet. People all over the world adore Apple’s phones, tablets, and computers, but they quite emphatically do not like the charging cords for those devices. People discuss the failings of these peripherals everywhere online, from product review pages to support forums to dedicated blogs full of frayed-cord gore. Yet there are avenues to complain about products that are obviously defective that could trigger a recall or other action. We started thinking about this issue based on an article about Lightning cords, the syncing and charging cords that debuted with the iPhone 5 in 2012, which are also used for iPads and iPods. Thomas Ricker points out the two-year lifespan and failure of his Lightning cords, even as the devices they power still work fine. Apple doesn’t consider cords part of the device that’s covered under warranty, and refers people who bought phones from their carriers back to those carriers. There have been successful class action suits that don’t settle until most users have stopped using the affected devices. We know that this is a common problem because people complain online about it routinely, yet Apple doesn’t change their fray-prone cords very much. Why? Tumblr is great for publicizing a problem, but do you know where you should be sending these pictures? The Consumer Products Safety Commission. Specifically, the SaferProducts.gov site. 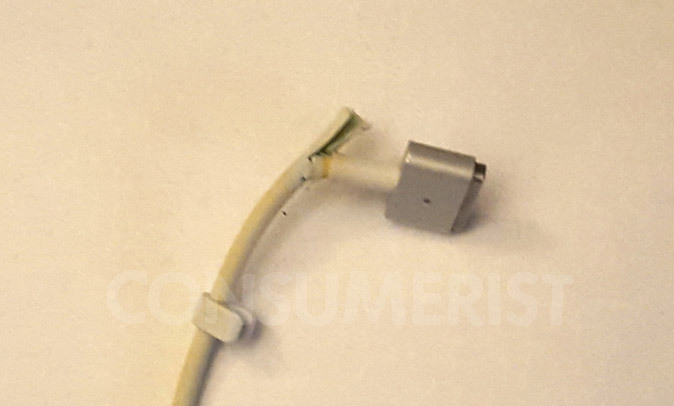 There are more than 2,000 reviews of the 1-meter Lightning cable on Apple’s site, most of which give the product only one star out of five and complain about fraying, breaking, or other serious issues. Meanwhile, if you go over to the public CPSC database and type in the words “apple” and “lightning,” there are only six reports. Complaining about a product to the CPSC is how you get federal regulators involved. While the website is not fun or easy to use, filing a complaint is free. Go ahead: the next time you feel like posting a photo to Tumblr or even leaving a one-sentence complaint about your drawer full of busted cords as a comment on an article, take the same complaint over to the CPSC. At least you’re making your complaint public and putting documentation in the hands of a government agency that might be able to do something about it.